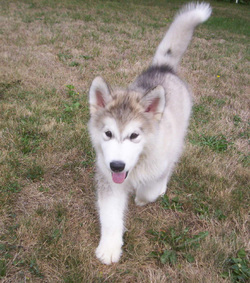 Alaskan Malamutes are large, active dogs with a lot of energy to burn! In order to keep them occupied, it is best to find things that exercise their mind as well as their body. I highly recommend obedience and agility training- you can do this in a class (be sure to get references from many people to find a truly qualified training school in your area), or even on your own, with the aid of some of the wonderful and helpful training books that are available out there. 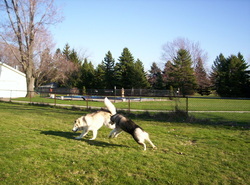 My dogs are all "clicker" trained- check out the resources available on this "thinking" method of training at www.clickertraining.com, and through www.dogwise.com. With Malamutes, however, there must be clearly established authority of the humans in your family- this does not take strength or physical punishment- it is MENTAL control- it is not uncommon in multiple-dog households to find that the smallest dog is the boss of the canines in the pack- this wasn't accomplished through physical means!! TEACH behaviors through reward and patience- you cannot punish or reprimand dogs for failing to behave in ways they were not taught how to do correctly in the first place. You will find that it is often more effective to train dogs what you WANT them to do in different situations, than it is to train what NOT to do. As a good friend likes to remind us all- "A spoiled Malamute is a ruined Malamute"!! As someone else once said- these dogs grow up quickly- whatever your small fuzzy puppy does, think about whether it will be cute when a big, nearly 100 lb. dog does it. If that would NOT be cute, DON'T let your puppy do it! It's much more difficult to untrain unwanted behaviors, than to put a stop to them early. Everything in balance- you cannot spoil or be overly "soft" or a pushover with this breed, nor should you train in a harsh or domineering manner. Many so-called dog trainers out there believe Malamutes are "stupid" dogs, because they are not as easy to train- this is FALSE, and such trainers are not truly very knowledgable about dogs. If this describes your puppy class trainer- find another trainer!! Malamutes are highly intelligent dogs- however their development and history required them to be smart enough to make better decisions than their humans, and determined enough to override the demands of those humans- the lives of dogs and humans often depended on this ability. What this translates to in today's world is a very smart dog, easily bored, and often amused by our silly demands! Malamutes can succeed in the areas of advanced training and competition (such as advanced obedience or agility), but only if they believe it's worth their time- it's up to their humans to make training fun, interesting, and rewarding!. To train a Malamute, you have to be smart enough to stay one step ahead of them, and interesting enough to keep their attention. NOT always easy!! While such dogs as poodles and border collies are very intelligent dogs, what makes them often easier to train than a Malamute is that MOST of them generally care very deeply about pleasing their humans- Malamutes care most about pleasing themselves- so you have to find ways to make training satisfying to this mostly unimpressed canine. It can become very rewarding to you, too, to find ways to make everything work. This is where I find that clicker training really helps- that, and utilizing very short training sessions, several times daily, rather than one longer session. In puppy classes, I often break up the routine by taking my puppy out for a few minutes, or quietly (so as not to distract other dogs) playing with a toy between training-I don't utilize the whole session I am paying for, but my puppy gets so much more out of it this way by stopping before he gets bored- it is very important to always leave them wanting to do more, rather than have them be glad it's finally over. I use several different training methods- I don't follow one thing exclusively, but rather take everything I learn from various sources, and blend them to suit the training I am doing. These are all excellent resources to help guide you and your dog to a deeper understanding of each other; please feel free to contact us for more titles, we are always adding to our bookshelf and DVD collections! 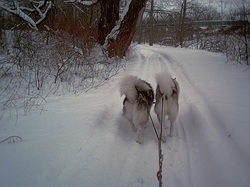 Of course, one does not HAVE to pursue advanced obedience exercises to occupy their Malamute- a nice long daily walk, weekend hiking, sledding....all these activities add up to a happy dog! As long as your dog has a chance to use up some of their energy in appropriate ways you will both be satisfied. But I do find it much easier to accomplish everything else, once there is a decent foundation of manners, training, trust and understanding in place...and the bond between you and your Mal is firm and strong. Teaching just the basics of sit, down, stay, wait, and not to pull on the leash will go a long way toward both of you enjoying each other's company!